Fantastic 180 degree view, Secluded and yet just 5 miles to the main Parkway . The VIEW! The cabin sits high on the mountain with sweeping 180 degree vistas. It's a great location to everything the area has to offer shopping, hiking, The Great Smoky Mountain National Park, dinner shows and all other attractions. You could be there for a week and do something different and new every day and still not do it all, which means of course you will have to return often. This 3 story cabin is truly 'a log cabin', real 'D' logs, no paint, no carpet, no sheet rock, all wood, floors, ceilings, walls. very homey, beautiful and nice! The pictures of both the cabin and the views do not do it justice. Wonderful experience. Everything was clean and the kitchen had all the basics for cooking. The view was incredible. Probably one of the best views we’ve had down here. The views are hard to beat at this cabin! The weather was great overall and the cabin was very nice! The path up to it was pretty intimidating while driving the truck bc of the sharp turns. An SUV would have been a little bit better. Quiet setting with incredible views! The cabin was very clean and well decorated. We really enjoyed the big screen TV and billiards as well as foos ball. I appreciated the detailed instructions for check-in and departure. The view from the hot tub was amazing! I would definitely consider staying here again. Everything was fine except we had lady bugs in the bed. Scared me at first until I seen it was lady bugs. There was a lot overall in the cabin. This guest is a trooper! Thanks for the great review and we are pleased to know the ladybugs while annoying didn't ruin your stay. The cabin is fabulous and the views are even better. Great location to Pigeon Forge area attractions and a short drive to Dollywood and Gatlinburg. By early spring the ladybugs will decide it's warm outside and that is where they belong. Come to the mountains and enjoy your stay with sweeping mountain vistas right out the windows and 3 decks to enjoy them from! I’d like to begin with saying that the views from the cabin are absolutely breathtaking. My husband and I went for a valentines getaway and absolutely loved the cabin, more so than any hotel or cabin we’ve stayed in anywhere else. The drive is NOT that bad. Neither my husband nor I have any experience driving in the mountains and the trek to the cabin was extremely doable. The only con is the Asian beetles just because there were soooooo many. I know the owners do there part, but for anyone traveling there when they’re in season I definitely suggest bringing some sort of house slippers to walk around and not get these pests stuck to your feet or socks. Overall it was an amazing trip and we will definitely be coming back! Yes breathtaking views indeed! Beautiful authentic log cabin, tastefully decorated with comfy furniture and amenities. We agree those asian beetles can sure be an annoyance. We sure wish there was a sure fire way to keep them out unfortunately not so. Yes we have done our part between sealing all the logs and spraying. Most guests like these don't let it ruin their stay and take it all in stride. 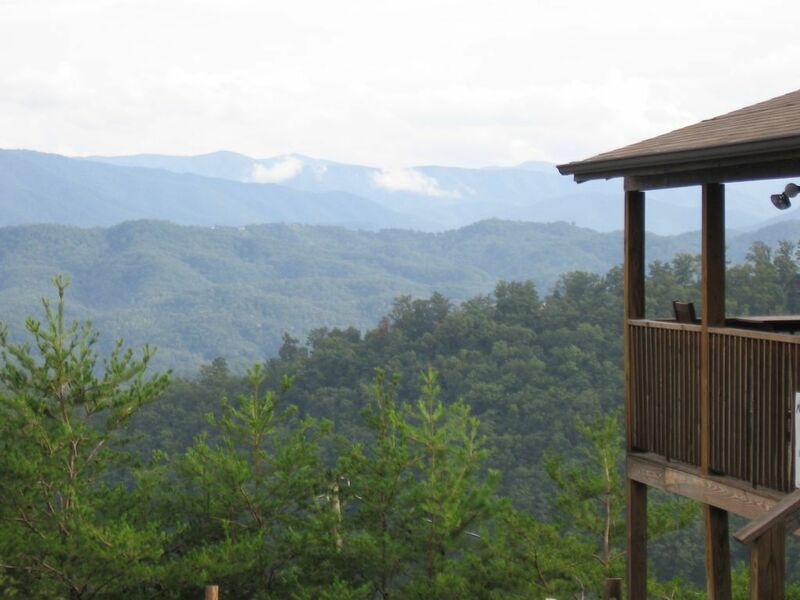 Great location and cabin to enjoy a great time in The Great Smoky Mountains. Everyone who came on this trip all agreed that this cabin was perfect. It was a ver easy check-in and check-out process. The location was perfect if you wanted to go into town but tucked away enough to feel like you were more isolated. There were clean sheets and towels. The beds were very comfortable. Lastly, the view from the top of the hillside was so beautiful! I highly recommend! Perfect indeed! Wonderful location, amenities and view, just what you come to the mountains for. These gals came for a girl getaway to have some fun before an upcoming wedding. They loved the area, the cabin and of course the views and you will too! Red Hot & Rockin' is the perfect place to honeymoon, vacation, spend a special day (birthday, anniversary, babymoon) and just plain have a fun, relaxing time.